I crossed the English Channel to spend a few days in Ipswich. Not to explore its beautiful port but to participate in the hackathon organized by BT, hosted by its Innovation Hub in Adastral Park (7th to 9th July). events in which software developers collaborate intensively around ideation and prototyping with specific Application Programming Interfaces (APIs) and on dedicated themes such as mobile apps, internet of things, home automation, connected car, etc. 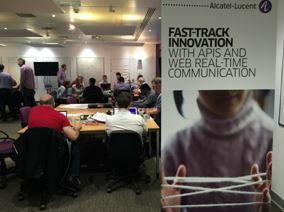 BT leveraged our Rapport APIs and Rapport Sandbox to run their first hackahon. Rapport is our communications software platform, used by service providers and large enterprises to deliver voice, video and messaging.